Oxford TEFL > Blog > TEFL > CPD in ELT. Keep calm and carry on! CPD in ELT. Keep calm and carry on! Duncan Foord is the Director of OxfordTEFL, Barcelona. He has 30 years experience in language teaching, teacher training, school leadership and management. He is the author of “From English Teacher to Learner Coach” (with Dan Barber, The Round 2014) The Developing Teacher (Delta Publishing, 2009) and The Language Teachers Survival Handbook with Lindsay Clandfield (Its Magazines, 2008). 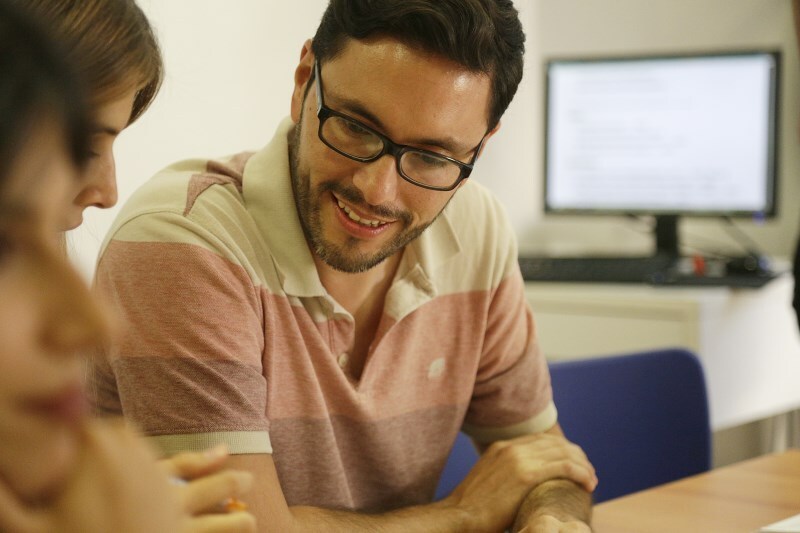 He is a tutor on the Trinity DipTESOL course lead trainer on the OxfordTEFL Leadership in ELT course. ELT loves an acronym. Look there’s one already! Those relating to Teacher Development I know of are TD (Teacher Development) CPD (Continuing, Continual or Continuous Professional Development). PDP (Personal Development Plan) PLN (Personal Learning Network) TT (Teacher Training). In this article I will look at these in more detail and give you my personal take on what they mean in practice, what options and opportunities you have and what might determine your choices? Teacher Development is the process of improving your teaching, which could be defined by you personally or someone else (like your school or teaching authority, if you work in one). Usually it is a combination of both, the result of personal initiatives and imposed activities and courses. Teacher Training (TT) normally refers to a specific course you take with a defined outcome. For example your school provides a five hour training course in using technology in the classroom or you sign up for a Trinity Diploma in TESOL course or DELTA to gain an advanced qualification in ELT. In this sense training usually involves other people helping you, whereas Teacher Development (TD) is more about helping yourself. So a training course may be part of your development, which can also include other activities such as attending workshops and conferences, doing action research, reading, reflecting on your teaching, getting feedback from your students and so on. But the distinction is inevitably blurred. For example you might choose to do a training course as part of your development. Put another way teacher development is the answer to the question, how did I get better at teaching? or how will I get better at teaching? Teacher development can be a conscious ‘to do’ list or something that happens without conscious direction. For example, a teacher in her first year of teaching is likely to improve her teaching hugely as the result of preparing and teaching her classes and hearing/reading the feedback her students give her. Three years later and still teaching more or less the same class types she may feel she needs to set herself new challenges to continue improving, such as teaching some different class types, engaging with other professionals in conference events, reading or taking a formal training course. Three years after that she may feel she wants to “relax” for a while, enjoy being a competent teacher, and not concern herself too much about whether she is getting better. Development for me is best thought of as a set of feature films rather than an ongoing soap opera, continual but not continuous. CPD rather than CTD tends to be used in the profession to describe programmes and policies designed, usually by schools and professional bodies, to improve teaching standards. However, Professional Development as opposed to Teacher Development implies to me a wider interest in your career. Professional Development is about becoming a better teacher, but also about changing jobs, promotions and exploring different paths within ELT such as teacher training, writing, research, entrepreneurial activity and so on. Most “CPD” programmes you come across in ELT are about improving your teaching in line with the organization´s ethos. There is nothing wrong with that of course. Assuming you share the ethos, CPD programmes and activities will be a tremendous support in helping you develop your teaching, but not necessarily your career. They are by nature organization based, rather than individual based, a spinning class at the gym not a bicycle ride in the country. You get fitter, but the aim isn’t for you to go anywhere. They are effectively quality control programmes QCPs if you will. They are a great idea, they just have the wrong name I think. Do we even need the C? For me Professional Development is about the choices you make about your work future and the reflections you have about your work past in the widest sense. It includes not just your classroom performance, ie. your relative competence compared to other teachers, but also how you live and enjoy that experience, the price you pay and the reward you receive for doing it, how you contribute to the profession, how you take care of yourself and the people around you. It is measured not only by the destination, like job changes and promotions, but by the quality of the journey. Above all it is specific to individuals. One size definitely does not fit all. Some teachers like to focus on their contribution in the classroom with students, others more on interacting with the teacher community, some want variety others want the opposite. Here are some options (not a to do list!) and pieces of advice. Think about what kind of person/teacher you are and want to be. No point dedicating yourself to random and time consuming activities and commitments if you don’t at least have an aim in mind. Bearing in mind your thoughts about point 1, you may decide your best option is to work in an organization, like a language school or university. If so, make the most of the opportunity and obligations on offer. Roll with it, even if some of the developmental activity required and suggested doesn’t really meet your personal needs and preferences. Join or set up a teacher support group of some kind, online or face to face. This could develop into a Personal Learning Network, with contacts who will support your teaching and your career development. Sign up for a course to develop a particular area of expertise like teaching exam classes, teaching young learners or teaching online. Sign up for the next level qualification. For example the Trinity Diploma/DELTA. This is particularly important if you feel you are stagnating in some way either in your teaching or in your career. This qualification will open new doors such as Senior Teacher, Director of Studies or Teacher Trainer posts. Remember the CELTA is an initial (apprentice) qualification. Consider becoming a master craftsman! Look after yourself! You may spend 50 years doing this. There is no point “developing” if you feel permanently overworked, underpaid and distressed, though of course you will sometimes feel that way. Too little stress can be as damaging as too much and you won’t always get the balance right. Take breaks. Change jobs if necessary. Talk to colleagues or friends if you feel overwhelmed. If you are interested in professional development, find out more about our Teacher Development courses or get in touch for more information. This entry was posted in TEFL, TESOL, Tips by Rhys Bonney. Bookmark the permalink.